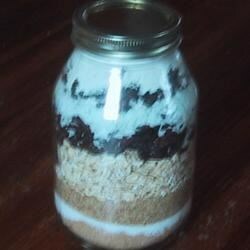 "Oatmeal Fruit Cookie Mix in a jar. The layers of different ingredients make a very attractive and once baked very tasty gift. If you can't locate dried cherries you can substitute dried cranberries or chopped dried apricots." Attach a card with the following directions: Oatmeal Fruit Cookies 1. Preheat the oven to 350 degrees F (175 degrees C). Line one baking sheet with parchment paper. 2. Empty the contents of the jar into a large bowl. Using a wooden spoon blend the mixture until well combined. 3. Using you hands work in 1/2 cup softened butter or margarine until the mixture resembles coarse crumbs. 4. Beat 1 egg with 1 teaspoon vanilla and 1/4 cup milk. Still using your hands or a wooden spoon blend the egg mixture into the dough until well combined. 5. Drop teaspoon sized mounds 2 inches apart onto the prepared baking sheet. Bake at 350 degrees F (175 degrees C) for 10 to 14 minutes or until the edges are lightly browned. Place cookies on a rack to finish cooling. Makes approximately 2 dozen cookies. These are so good. I used dried cranberries instead of dried cherries. Pretty mixture! Next time, I will see that the recipe says to mix in a liter jar! A quart jar is too small, so the giftee gets the quart jar and the extra flour mixture!